Are you also joining pioneering cities such as Amsterdam, Milan, Montreal, New York, Paris, Toronto & Vienna to the Sharing Cities Summit in Barcelona? Read the latest about the Summit on page 3 & 4! 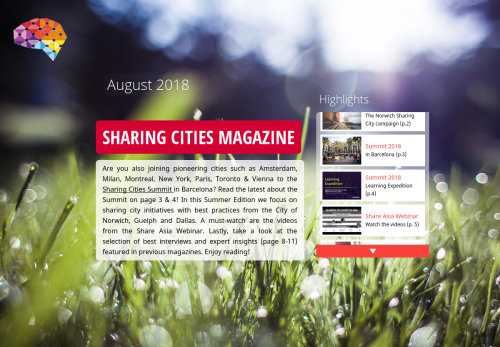 In this Summer Edition we focus on sharing city initiatives with best practices from the City of Norwich, Guelph and Dallas. A must-watch are the videos from the Share Asia Webinar. Lastly, take a look at the selection of best interviews and expert insights (page 8-11) featured in previous magazines. Enjoy reading!